At prolight+sound 2005 show, Frankfurt, Germany, Dynacord launched its D-LITE 2000 satellite system, tailored to the needs of entertainers, mobile DJs and small bands. Central unit of the Dynacord D-LITE 2000 system is the PowerSub 315 active subwoofer. Weighing in at 39 kg, the PowerSub 315 comprises a 1000 watt Class D amplifier powering the 15" driver, 2 x 500 W for the satellite speakers, and all of the audio processing. Optimizing the air stream, the high-speed laminar vent (HSLV - patent pending) is designed to deliver extremely high sound pressure levels down to 32 Hz. The PowerSub 315 is capable of powering up to four 8 ohm satellites (two per stereo channel) and an additional pair of 8 ohm subwoofers. 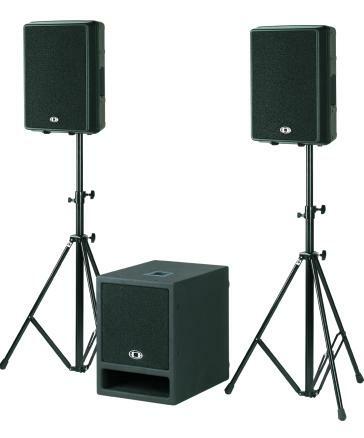 Adding extra versatility, the subwoofer's output level is adjustable as well as there is a choice of three sub/satellite crossover frequencies. Featuring a 12" driver and a ND-2 neodymium tweeter with a 80° x 40° constant Q HF horn, the D12 comes in a in polypropylene enclosure. Exhibiting the same dimensions as its active counterpart, the SUB 115 passive subwoofer is designed to complement the D-LITE 2000 system if extended bass performance is required.